NEW YORK (AP) — Captain Chesley "Sully" Sullenberger, who was hailed a hero after piloting the US Airways flight that landed on the Hudson River in January of last year, is retiring. Sullenberger will fly his final flight Wednesday afternoon, along with his co-pilot during the Hudson landing, First Officer Jeff Skiles. Sullenberger will end his 30-year career when he lands at his home base at Charlotte (N.C.) Douglas International Airport. He will officially retire at a private ceremony there with fellow pilots and other US Airways employees. 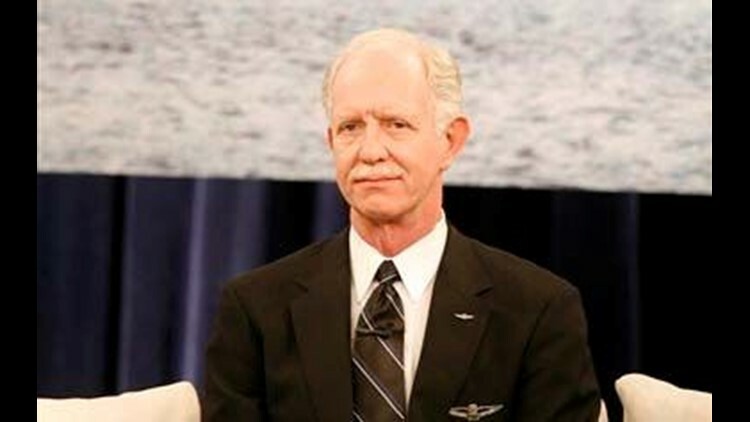 Sullenberger, 59, joined US Airways' predecessor airline in 1980. Flight attendant Doreen Welsh, 59, who was on Flight 1549 when it landed in the Hudson, is also retiring. Welsh, 59, joined US Airways' predecessor airline in 1970. All 150 passengers survived the emergency river landing in January 2009 when the plane's engines were struck by birds. The plane landed within minutes of taking off from New York's LaGuardia. It was supposed to fly to Charlotte, N.C.
One of the survivors, Mary Berkwitz, said by phone from her Stallings, N.C., office that she was disappointed to hear the news. "Every time I get on a plane, I feel like, Oh God, I hope it's Sully at the pilot's seat. Now I know it's not going to be. In a way it's sad," she said. Since that famous flight last year, Sullenberger has testified before Congress regarding pilot safety, given speeches about education and written a book, "Brace for Impact." He became a member of US Airways' flight operations safety management team last September. Capt. James Ray, a spokesman for the US Airline Pilots Association, which represents US Airways pilots, said that Sullenberger plans to spend more time with his family in retirement. He will also continue to talk to lawmakers about raising minimum qualifications for pilots and work to lower the maximum number of hours pilots are able to work in a single day, Ray said. "Each generation of pilots hopes that they will leave their profession better off than they found it," Sullenberger said in a statement. "In spite of the best efforts of thousands of my colleagues, that is not the case today. "Though I am retiring, I will continue to serve as the same kind of advocate I have always been — not only for aviation safety, but for the airline piloting profession," ''I will work to remind the entire industry — and those who manage and regulate it — that we have a sacred duty to our passengers to do the very best that we know how to do." While Sullenberg walked away from the emergency landing unscathed, flight attendant Doreen Welsh was seriously injured in the crash and has been diagnosed with post-traumatic stress disorder. Speaking to The Associated Press from her home in Ambridge, Pa., she says she is still afraid of the water. Her continued discomfort while flying since the crash led her to the decision to leave the only job she has ever had. She signed on at the age of 19. "I grew up out there," she said. Like Sullenbeger, Welsh plans to move on to a career giving speeches about her experience in the crash. "I feel grateful for still being alive," she said. The opportunities of the last year "have been wonderful, but it was a high price to pay. And if I could go back, I would have rather just been flying and doing my job and not having gone through that, because I have to live with that for the rest of my life." Associated Press writer Samantha Gross in New York contributed to this report.